Created by 6b251803a89899b5bc8c7709db4c78261ad820a5 on Oct 8, 2015 7:40 AM. Last modified by megan.truett on Jan 5, 2018 2:45 PM. As the search engine marketing and social paid programs manager at Marketo, I have always loved the fact that my work involves both number crunching and creativity on a daily basis. On that note, the best part of my job is probably that I have the opportunity to find new ways to increase click-through and conversions rates on our site. This requires reviewing and assessing data and then drumming up new ways to craft digital ads based on what I have learned from that data. What is the process called? A/B testing! A/B testing is the strategic process of comparing two versions of creatives, ad copy, headlines, etc. to see which one performs better. Then, with that result, you know which aspects of your website to change in order to yield more clicks and conversions. In most channels, the best practice is to keep your ad headline short ‘n sweet, however, one of my colleagues wanted to test a longer version of the ad headline and so we went for it (hey, you never know). To my absolute shock, the longer headline actually won the test—and by a good margin, too [.28% click-through rate (CTR) vs a .19% CTR]! 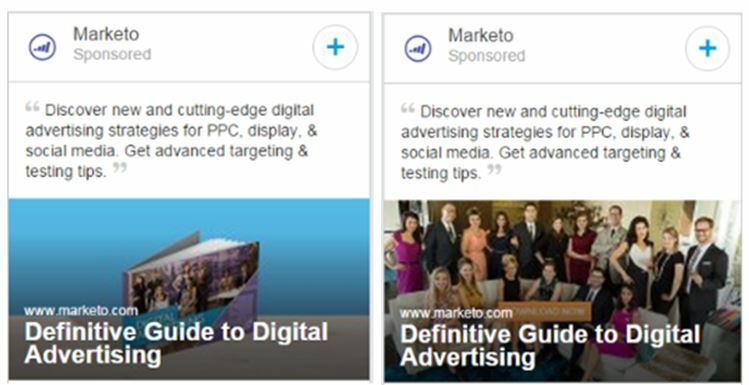 Below is another example of A/B testing in digital ads. Here there was a profound difference in click-through rates, with the ad that contained the image of people garnering .64% CTR and the ad containing the image without people garnering a measly .11% CTR. What a difference a picture makes! So, what is the primary lesson we can all learn from this? A/B testing shows us that we cannot make decisions based on our instincts alone. We must back them up with evidence. And that evidence comes straight from testing. Therefore, I am a strong believer of testing pretty much anything I possibly can in my campaigns—if it’s testable, I’m all over it! In order to conduct a comprehensive assessment of your programs and campaigns, and be sure that you’re constructing them the best you could be, I hope you will get on board with this comprehensive approach, too. 1. Ad headlines: The right headline really helps with click-through rates. You should come up with at least two—if not more—versions of your headlines to see which one better captures your audience’s attention. The target audience on most channels is different, too, so what works as a headline on LinkedIn might not work on Facebook, and so on. The take-away here? Test a few versions of a headline on each channel. 2. Ad copy: It is often difficult to fit your core message in your headlines, so your ad copy is the next best place where you can try and include some messaging. Don’t miss the opportunity to test the messaging here, too. 3. Creatives: Images, colors, and text all combine to make a great display creative. You can play with the colors and images to make your display ads stand out more. 4. Ad units: It is important to test the different ad units and sizes to see which one performs best for you. It is a best practice to start a campaign with as many units as possible and then based on the results, keep the best performing ones intact. 5. Time of day: Spend some time assessing what time of day during which your audience has the highest interaction with your social posts or searches for your keywords. This is important especially when you have limited budget to work with. 6. Days of the week: Depending on your business, certain days of the week might work better for you versus others. Again, knowing the days that you get most interest on your social posts or your Google search ads can be helpful so you can increase your budgets during those days and turn it off during the others. This will help maximize your budget and increase sales and conversions. 7. Call-to-actions: Testing your call-to-actions can be very powerful. Sometimes changing a simple “Download Now” button to “Submit” can increase your conversion rates by a few points, or changing the color of your download button can bring you more conversions, too. This is a simple thing to test, so don’t leave those additional conversions on the table. These are just a handful of the elements that I always like to test; this is not a complete list. There is a lot more you can test. You can start with some of these and build on them as new ideas pop up. Finally, I would just like to mention that testing is an ongoing process—there’s no end date, so don’t expect there to be! With that said, make sure you continue to add new tests into your campaigns. It is important to document the changes you make, analyze the results, implement those results, and then repeat the process again and again…and again. I hope you find these tips useful! If you would like to know more about testing as well as other topics regarding digital advertising, such as targeting, segmenting, measuring, and budgeting, please join us for our upcoming webinar “Tips to Evolve Your Digital Advertising” on October 13th. Register today!